This post, written by Better Budget TO member Andrew Do, first appeared on Medium. If you heard you could influence the outcome of how to spend tens of billions of dollars to make your city a better place, would you do it? I imagine many would find the prospect exciting, if not a little intriguing. Some might ask, what’s the catch? How about figuring out what a deputation is and how to make one? How about feeling like you need to be an expert on the nuances of public finance? How about getting a sense, rightly or wrongly, that decision-makers are not interested in having a dialogue about what you think billions of dollars can do to make the city a better place? To Better Budget TO, the budgets process represented to a civic forum that encapsulates the simultaneous ambivalence of frustration and hope, borne out of a desire to make one’s city a better place. This was the motivation behind our 2015 report: Putting the Public back in Public Budgeting: Review of the 2015 Toronto Budget Process. When we wrote this report, we were curious about how other residents felt about the budget process, particularly those far away from the core where their lived experiences were likely to differ from that of a resident of downtown Toronto. To this end, we interviewed residents up in the Jane and Finch neighbourhood. We did this by hosting an interactive workshop with residents, complete with sticky notes and flipchart paper. We asked residents what they thought about the budget process, what they hoped to get out of it and what their pain points and opportunities to improve the process might be. Many of these residents being from Jane and Finch have a different lived experience then residents that live in say downtown. Being aware of this, we needed to find a partner to help us find residents we can speak with and were fortunate to have found a partnership with the Jane/Finch Family and Community Centre. Their help was instrumental in finding residents we can have a conversation about the budget with. Interest: The stage at which citizens become “activated” to interact with the budget process. Learning: The stage at which citizens come to learn and research aspects of the budget process. Engagement: The stage at which citizens engage with the budget process and articulate their thoughts to decision-makers, including key members of the community. Reflection: The stage at which citizens are thinking about the final impact of the budget on them. 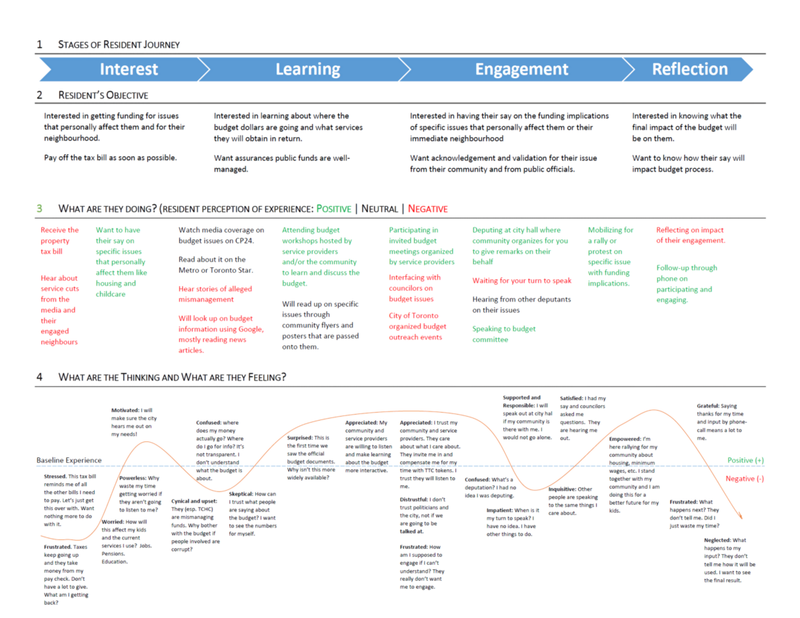 Throughout these steps, we attempt to surface what residents are trying to achieve at each step, what positive and negative experiences they have throughout the overall budget interaction and what their internal thoughts might be at each step in the journey. This is captured in the journey map below. From our conversation, a few key themes emerged that can help us shed some light onto the citizen experience of interacting with the budget process. Neighbourhood Pride: Residents, despite being aware of the less than flattering reputation of their neighbourhood expressed immense pride in living there. Neighbourhood pride and making their immediate neighbourhood is what motivated many of these residents to participate in civic life. Community Mobilization: Residents were excited at the prospect of airing their views to decision-makers through the budget process. It represented an opportunity for community mobilization. They were especially excited to know that they had a community of people behind them that supported them as they expressed their thoughts. Other citizens throughout the city expressing similar thoughts was seen as especially validating to citizens. The Role of Media: Residents become aware of the budget process through the media, particularly with television news. They come to learn about the budget process through these news stories and did not engage with official City of Toronto budget documentation. If they came across the budget on the media however, the stories that stuck out were not necessarily educational or informative. Budget accessibility: Residents often were not aware of the larger implications of the budget and did not have a baseline of the current status of the budget. They often were unable to connect the budget process with how it will impact their local neighbourhoods. Furthermore, residents expressed feeling stupid and powerless when interacting with the budget process due to the perceived complexities of the budget. They believed that the process was designed to leave them out. Budget follow-up: Residents wondered if decision-makers actually took their feedback into account and what impact it had. Residents expressed wanting a follow-up process, ranging from an acknowledgement of their feedback to incorporating to their feedback within the budget process. This was an element of the budget process that left a lot to be desired. Better engaging the media to ensure there is an educational component to the budget process. Connect the budget process to issues that matter for residents at a neighbourhood level. Think about a follow-up process to the feedback that residents give when engaging with the budget process. A comprehensive community consultation process for our budget is one that requires serious thought and effort about what the end-to-end experience looks like from the point of view of residents. There are promising elements about the current status of the budget consultation process but we believe there could be a better budget consultation process where residents have an empowered and enjoyable experience.